That’s a cool tattoo to get. The time will be right one of these days. Wish we had a river to cool off in–ours resembles a creek right now more than a river. sounds like a super time! i like reading about happy things going on in your life. it makes me smile. That definitely is a horse of dog! Great Dane, right? I would love to have one.. but they are SO big. Looks like you guys had a great weekend together 😀 That’s always great! The tattoo sounds neat! Bummer everywhere was too busy/too expensive. 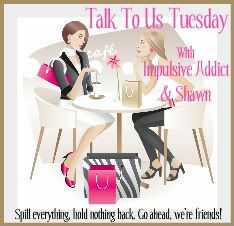 Stopping by from Talk To Us Tuesday! HOLY CRAP that dog is AWESOME. You are just so sweet. I hope you guys are having a great summer. I love Great Danes but will never get one, their 7 year life expectancy makes me sad! I’ll have to look up that cartoon. I love tattoos that have a meaning not just the random flipping through the book I’ll take that one tattoo. Know what I mean? I love the pictures of you and Match at the lake! And I think the tattoo idea is a good one! Erik wants a Great Dane or a bull mastiff– i just saw Shawn’s comment that Dane’s only live for 7 years- that is SAD! I would love to find a tattoo that had my kids names in it and if I had a place in mind to put it, I would be more inclined to hunt the perfect design but I can’t figure out where I’d put it. Looks like a fun weekend! !